W-G's Hannah Miller anchored the shuttle hurdle relay for the hosts Thursday in the Hugh Cavanaugh Relays. 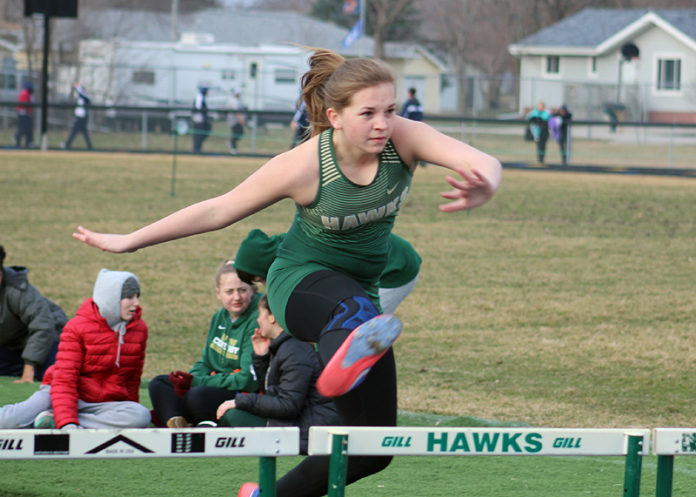 HUXLEY — The Woodward-Granger girls thinclads were in action at the Bomber Relays Friday, one of four teams in the Class B portion of the meet. Forest City finished with 178 points and Collins-Maxwell with 168 while Carroll had 148 points and W-G 63. The Hawks did not have entries in either the high jump, 200 dash or 100 hurdles. Posey Robinson had the two best individual event finishers for W-G after placing fourth in the 1500 and 3000, in clockings of 6 minutes, 53.92 seconds and 14:40.62, respectively. Maggie Halferty was fifth in the former in 7:08.69 and McKenzie Dresback fifth in the latter in 16:05.08. Bella Milosevich was fifth (3:05.18) and Maddy Mann sixth (3:06.28) in the 800, with Hannah Miller sixth in the 400 (1:33.49), Chloe Hogue sixth in the 100 (14.51) and Brayten Ashman sixth in the 400 hurdles (1:26.24). W-G’s best relay finish was a second-place showing in the 4×400, which crossed in 4:31.2. The Hawks were third in the 4×200 (2:00.28), 4×800 (12:41.42), sprint medley (2:01.97) and shuttle hurdle (1:29.12) while the 4×100 (58.66) and distance medley (5:09.54) teams both finished fifth. The names of those participating in the relays were not made available. Both W-G squads will compete today at the Carroll Coed Relays, with the Hawk girls visiting Ogden Thursday.